In the central nervous system, extracellular matrix (ECM) molecules, including hyaluronic acid, chondroitin and heparan sulfate proteoglycans, tenascins, reelin and agrin, along with their remodelling enzymes, such as neurotrypsin, neuropsin, plasminogen activators, and metalloproteinases, are secreted by neural and non-neural cells into the extracellular space to form the ECM and signal via ECM receptors. Despite recent advances in the ECM field, the importance of neural ECM for physiological and pathological processes is currently less widely recognized than that of other CNS elements. 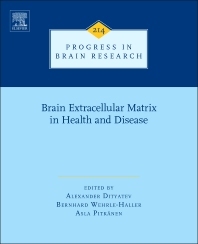 This book will enlighten recent progress in our understanding of mechanisms by which neural ECM, its receptors and activity-dependent ECM remodeling regulate neural development, synaptic plasticity, and contribute to pathological changes in the brain. In the first part, the roles of ECM signaling and proteolytic modification of ECM in neurogenesis, neural migration, axonal pathfinding, synaptogenesis, synaptic and homeostatic plasticity will be discussed. The second part will focus on the emerging ECM-dependent mechanisms associated with CNS injury, epilepsy, neurodegenerative and neuropsychiatric diseases. For further development of neural ECM field, a very important contribution is the third part of the book, which is devoted to neural ECM-targeting tools and therapeutics. The concluding fourth part will highlight advances in development of artificial ECM and ECM-based systems suitable for multisite recording and stimulation of neural cells. Neuroscientists, psychologists, neurologists. The volume will serve as an outstanding reference for both those just entering the field and experts seeking an update on this fast moving area.